Track Jupiter's Path Like An Ancient Babylonian : The Two-Way Clay tablets show that Babylonian astronomers tracked planets using a method that was thought to be invented 1,400 years later. In a way, scientists say, the ancient techniques were "very modern." 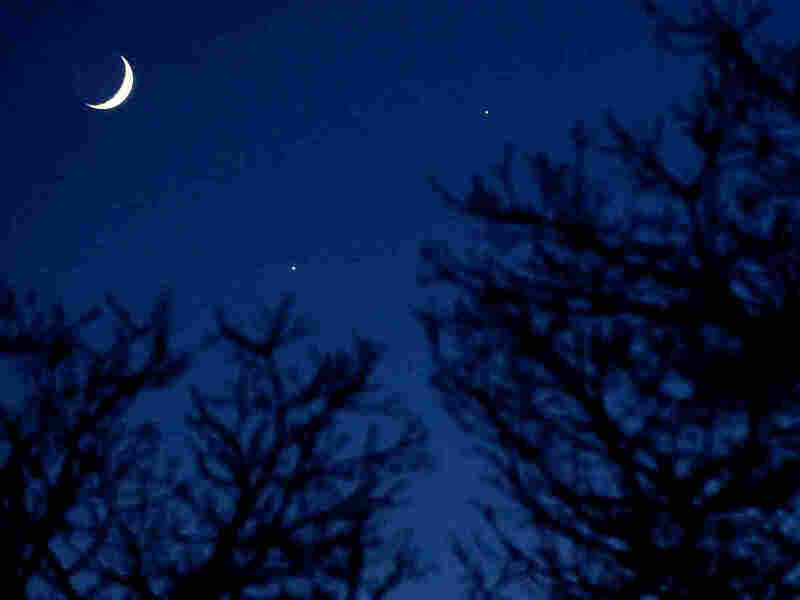 A view from Earth of a slender crescent moon in close proximity to the two brightest planets in the sky, Venus and Jupiter. Ancient Babylonian astronomers tracked the motion of Jupiter using a technique that historians had thought was invented some 1,400 years later, in Europe. That's according to a study published Thursday in the journal Science by Mathieu Ossendrijver of Humboldt University in Berlin. He has a Ph.D. in astrophysics, but instead of studying the stars, Ossendrijver spends his days poring over crumbling clay tablets, covered with the tiny scrawls of long-dead Babylonian priests. The Babylonians lived before the birth of Christ in what is now Iraq. And they were obsessed with trying to predict the future by watching the stars and planets. In fact, they came up with the idea of astrology as we know it today "with horoscopes, and with the zodiacal signs — the 12 signs," says Ossendrijver. "That was invented in Babylonia." Ossendrijver has been doing a close study of a few hundred cuneiform tablets that deal with the hard-core mathematics of Babylonian astronomy. They date from 400 B.C. to 50 B.C., and they're filled with numbers and arithmetic — except for four mysterious tablets that are different. "Nobody understood what they are about, including me," says Ossendrijver. "I didn't know it until very recently." It's not a cracker; it's a cuneiform — an ancient clay tablet with calculations involving a trapezoid that helped the ancients track planets. These tablets talk about a shape: a trapezoid, which is a rectangle with a slanted top. The tablets don't have an actual drawing of a trapezoid, they just talk about its sides and its area, and dividing the area into parts. What exactly were the ancient astronomers doing? Last year, Ossendrijver made a breakthrough. "I found, so to speak, the key to understanding these weird texts that deal with trapezoids," he says. 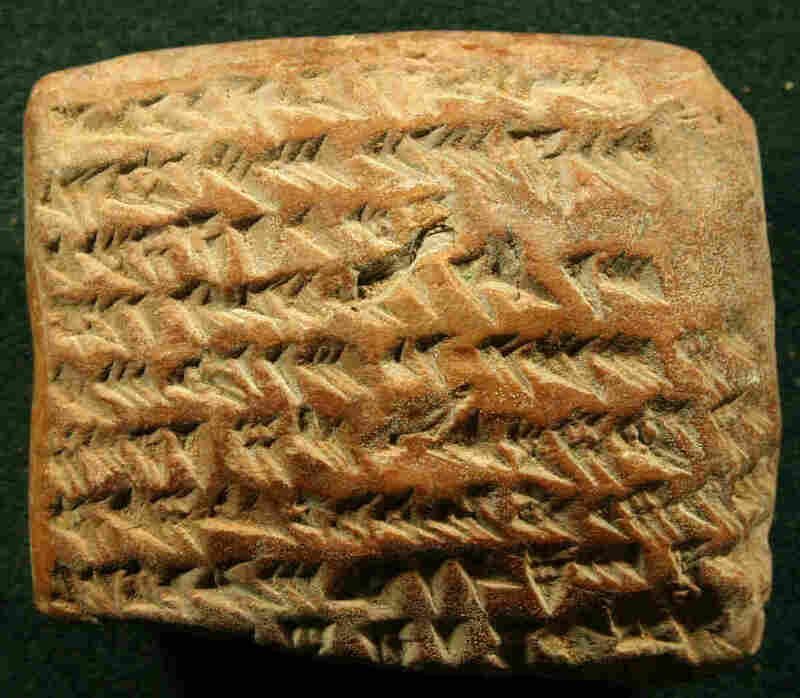 The key was another clay tablet that describes how the planet Jupiter moves across the sky. He noticed that the numbers on this tablet matched the numbers on those strange trapezoid tablets. "So, that was like the 'aha!' moment," he says. Ossendrijver realized that the Babylonian astronomers were using the tools of geometry to deal with a very abstract concept — how the velocity of Jupiter changes over time. Now, historians knew that Babylonians used geometry to work with physical objects — a plot of land, say, or a building. But this is way more sophisticated and modern. In fact, historians had thought this method was invented in 14th century Europe. The discovery has wowed scholars like Alexander Jones at New York University's Institute for the Study of the Ancient World. "It's a kind of a tour de force, teasing out the meaning from these sources," says Jones, "and what he's found is really quite remarkable." The person reading the tablet to make astronomical calculations is supposed to imagine a figure in which one dimension is distance traveled per day and the other dimension is time, says Jones. "I'm quite surprised," Jones says, but then added, "I'm not surprised that this is coming out of Babylonia, because these astronomer-scribes of the last five centuries B.C. or so really were amazing." Noel Swerdlow, a researcher at Caltech who studies the history of astronomy, says the analysis of these tablets appears to be correct. But he also wasn't at all surprised to learn that the Babylonians could do this. "They were very, very smart, and the more we learn of what they did, the more impressive, the more remarkable it becomes," Swerdlow told NPR by email. Of course these priests wanted to track Jupiter to understand the will of their god Marduk, to be able to do things like predict future grain harvests. Nonetheless, says Jones, they had the insight to see that the same math used for working with mundane stuff like land use could be applied to the motions of celestial objects. "They're in a way like modern scientists and in a way they're very different," says Jones. "But they're still coming up with things that we can recognize as being like what we value as mathematics and science."